By Chris Williams on April 17, 2015. Seeing adult carpet beetles on interior walls does not necessarily mean that you have a carpet beetle infestation, although in spring it usually does. 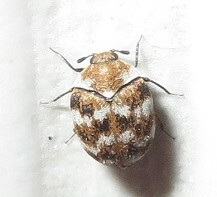 I say “not necessarily” because the normal environment for carpet beetle adults is outside where they feed on the pollen and nectar of flowering plants. That’s right, the beetles don’t feed on carpets or woolens like the larvae do. Beetles that you see inside could be there accidentally, having flown in or been carried in from outside. It’s more likely though that the beetles came from inside and are trying to get outside. Carpet beetle larvae remain hidden in or under their food source. They’re rarely seen unless you have a seriously infested item and the infestation eventually becomes obvious. After the larvae pupate and the adult beetles emerge in early spring, they are attracted to light in an attempt to get outside to mate. At this time, carpet beetles are climbing walls and flying to windows. You can find them dead on windowsills or caught up in spider webs near lights (see Why Are Those Tiny Beetles Crawling Up My Walls?). Most low level carpet beetle infestations are simply a result of less than fastidious vacuuming, especially in homes with pets. I’ve never seen research on this, but I suspect that homes with pets have more of a problem with carpet beetles due to accumulations of pet hair. Household “lint,” not wool carpets, is probably the main food source for the beetle larvae in most homes. They feed on hairs from people and pets, lint, food crumbs, dead insects…the kinds of things that accumulate in inaccessible corners or under heavy furniture. If we could narrow carpet beetle infestations down to household lint or carpets, inspection and control would be a lot simpler. But, carpet beetle larvae also feed on various other things around a home that are either of plant or animal origin such as wool blankets or clothing, stuffed furniture, animal furs , hides or trophies, accumulations of overwintering insects like lady beetles, rodent or bird nests, pet food, people food, and down pillows—to name a few (see Carpet Beetles Are Not Just in Carpets). Most homes probably have a few carpet beetles present, and most of the time we don’t even notice them. It’s when you have a lot of adult beetles climbing walls or flying to windows that you need to look for another source of the infestation. Give Colonial Pest a call. Our technicians can inspect your home for potential carpet beetle sites. We can also verify that what you’ve found are indeed carpet beetles (no offense to your son’s scientific expertise! ).